We use shallots all the time in our kitchen, so it’s essential to understand how to cut a shallot. 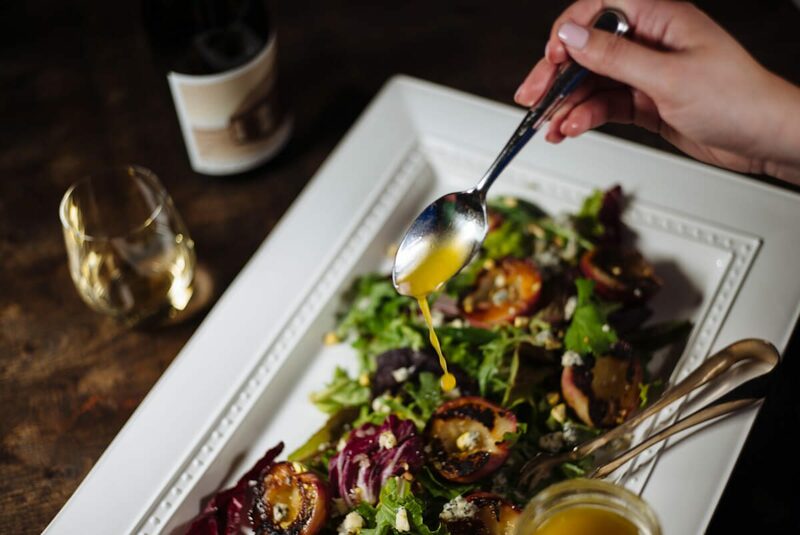 One of our go-to salad dressings is this Meyer Lemon and Shallot Vinaigrette, and we use this Simple Herb Butter on everything from grilled corn to grilled oysters. The majority of the times we use shallots, we finely dice them, however, there are times that we’ll shave them in cross sections on a Japanese Mandoline for Steak with Crispy Shallots or Asian fried shallots. The technique is very similar to dicing an onion, and you’ll need the same basic equipment: a cutting board, and a very sharp knife. By far our favorite knives are this from Zanmai, and this one and this one from Misono. We also love this one, this one, and these. You have two options for knives to dice a shallot, depending on how comfortable you are with your knife skills. 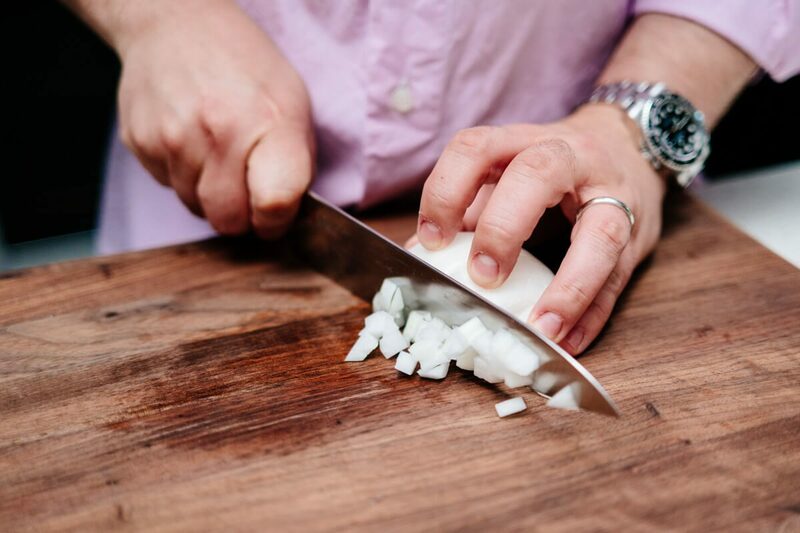 Since shallots are typically pretty small, you might want to practice with a utility knife since it’s smaller and easier to handle. We use a chef’s knife since it’s a little faster. To dice the shallot, cut off both ends. then slice it lengthwise through the center (see how to cut an onion for more detailed instructions and step-by-step shots). Peel the outer skin off, and set the shallot flat side down on the cutting board. Working from one end (we’re right-handed, so for us, the right side), make horizontal slices through the shallot, stopping about 1/4″ from the other end. Next, put the knife on the top of the shallot and make lengthwise slices about the same distance apart as the thickness of the horizontal slices you just made. Finally, cut the shallot crosswise into dice. If you’re going to cook the shallots and want proper dice, make the cuts the same distance apart as the thickness of your horizontal and lengthwise slices. 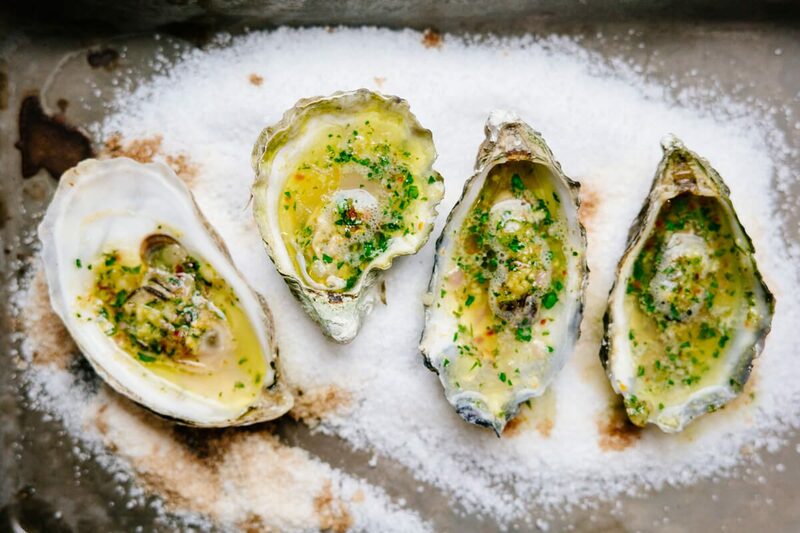 If you’re using it in a dressing, you can make these slices thinner for more of a minced texture. Make sure to wash and dry your knife as soon as you’re done using it for the day and don’t let them sit in water. Never put them in the dishwasher!